We welcome you to the cities of Minsk, Belarus and Moscow, Russia home to photographer and Instagram fashion blogger Dima Bychick who's showing off his unique European street style. He originally grew up in a small town even considered a village where he spent much of his adolescence cycling and with his dog. 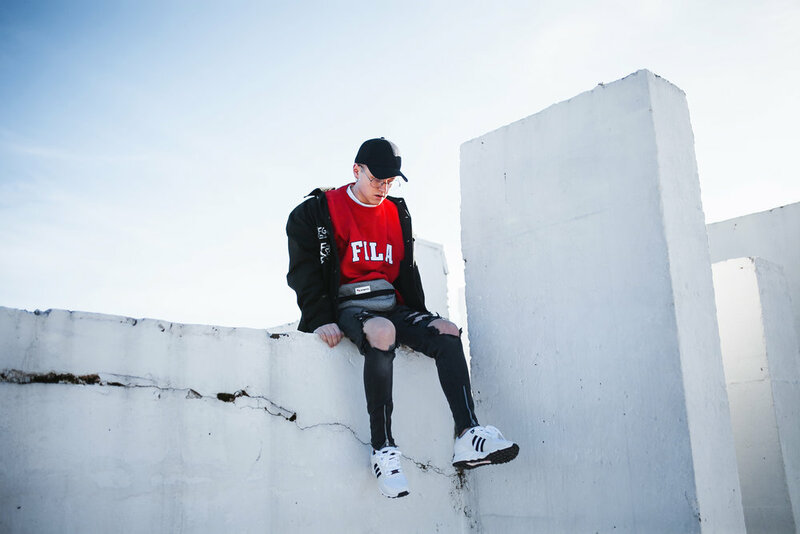 When wide-leg jeans became a popular trend in Dima's local area, he began to take an interest in hip-hop culture and the style that came along with it. His fashion sense started to involve into more mature urban apparel which too took a grasp where Dima was from. Yet, today's blogger was prepared to take his own outfits one step further than the rest. Today, Dima's clothing is tailored to his own likes. He draws different letters on his clothes, rips his own denim, and reworks and resows all his pieces for a personal touch. His custom sense of fashion is where he can truly shine. His love for fashion is now an integral part of who he is. Dima especially admires those who makes clothes whether its more simple or complex. He's pleased to be part of such an industry that he mentions is like a general organism where every component is needed to keep it running properly. Soon, Dima is looking to expand a new line of his, F.G.L., to introduce his own characteristic clothing to the world. For street fashion in Russia and Belarus, Dima composes outfits like no other. He centers a lot upon Adidas street style including multiple types of their shoes, pants, and jackets. His fashion also includes a lot of classic ripped jeans as well as classic white tees that always work in a pinch. Dima's black hats and beanies which seem endlessly versatile are a trademark look of his along with other black tones to match. Even though he centers on street looks, they are definitely very diverse from each other sometimes including vibrant and popping colors as well as awesome graphic tees and hoodies. We can't wait to see where Dima takes his unique style next whether it's in Minsk, Moscow, or somewhere in between. Follow Dima on Instagram @dimabychick or like his new facebook page @dimabychick!